“Esse quam videri,” the motto of my high school, translates as “to be rather than to seem.” This motto, and Robert Fulghum’s book, “All I Really Need to Know I Learned in Kindergarten,” have influenced the way I work with clients for years. When it comes to how we in the financial-services industry should promote ourselves, we might want to channel the guiding principles offered by Fulghum and my high school motto. In kindergarten, we are taught to be real and to be authentic—this is the essence of esse quam videri. Humility, honesty, compassion, empathy, and so many of our core basic values are taught to us by age five. Unfortunately, as we grow older, go through schooling, and enter the business world, those basic lessons somehow get lost, superseded by a completely different order and ethic. In fact, the unwritten code in business often seems like the antithesis of esse quam videri, where appearances and image can reign supreme. However, for me the ultimate question becomes “how to be,” not “how to appear,” and my goal is to remain committed to all of those critical life lessons learned early. Unfortunately, in the financial-services industry, the opposite kind of image, attitude, and behavior is tolerated—even rewarded. Certain stereotypes and norms dominate particular industries, and then the public expects people within that industry to adhere to and fulfill those expectations. Physical appearance might be the most obvious example, but there are other manifestations as well. Societally, we have come to expect a bank CEO to be dressed in an expensive suit, and we judge him to a large degree based on that exterior portrayal. If a bank executive were to enter a meeting wearing jeans and a sweatshirt, such misalignment with our expectations could very well overshadow our evaluation of his credibility and, I dare say, even his intellectual capacity or other valuable attributes. Situations where advisors might be judged based on image over substance include the slickness of marketing brochures, how and where we entertain clients, to which clubs or organizations we belong, the cars we drive, and even our vacation standards. Even deliverables such as a leather-bound financial planning binder are sometimes evaluated by clients based on their length, heft, and appearance. While we know that we shouldn’t necessarily “judge a book by its cover,” let’s face it, it is easy to be influenced (consciously or subliminally) by the external trappings in any sales or service situation. I am not so naive as to believe that the packaging of a message is not important. However, I do believe that we as financial advisors should better develop and emphasize our value-add in terms of content and essence with respect to our business-development efforts. And, perhaps most importantly, I think it is critical to let clients know one’s values and belief system both in the absolute and how it relates to wealth and investment management. Although many of us appreciate that we cannot do business with everyone we meet, advisors most commonly rely exclusively on assets and account size for their screening process. For me, identifying people whom I like and whose values I share is the most significant element that I weigh when expanding our firm’s clientele. The point is that there has to be a fit. We have been indoctrinated in the industry to convert prospects into clients almost on a mechanical basis, without expressing what the right fit is for us. Instead of pitching to everyone who comes our way, we need to get in the driver’s seat and reach out to those who fit with our values. We have a commitment to build and create wealth for our clients. Individuals, families, and businesses come to us seeking a unique approach for managing their investments. They share our values of financial responsibility and accountability. The goal of our investment strategies is to take advantage of potential returns while navigating through the ever-changing economic climate of the new economy. We take responsibility for actively evaluating markets to determine where and when to invest. We seek to earn positive returns in both positive as well as negative market conditions through a variety of unique and complementary offensive and defensive investment strategies. This enables our clients to feel confident that a highly experienced professional is researching and vetting all types of investments and is diligently monitoring their portfolios on a regular basis. We go on to say that we take pride in educating our clients and, through doing so, strive to help them create a legacy. We want clients who are truly open to discovery and an interactive process, and can come to share our philosophy that managing risk is usually more important than seeking alpha. Clients, for example, will be exposed to our thinking that part of “playing defense” may involve asset classes and sophisticated strategies well beyond the traditional passive stock and bond strategies they have been exposed to in the past. Creating a “brand” for my firm in terms of client fit and our philosophy is much more rewarding than overweighting a prospect’s balance sheet. Furthermore, it makes the business far more satisfying and greatly enhances the “stickiness” of accounts. Of course, sharing values may incorporate facets of lifestyle, image, and financial status, but it also includes working with people who are open to new ideas and manifest their loyalty to those who made them aware of the ideas. Additionally, it includes an appreciation for risk management, active investment management, and customized/goals-oriented planning, versus a preoccupation with benchmarked performance. Understanding the types of clients to pursue, and dismissing those who are not a fit, is not an easy exercise. It requires soul searching, commitment, and discipline. 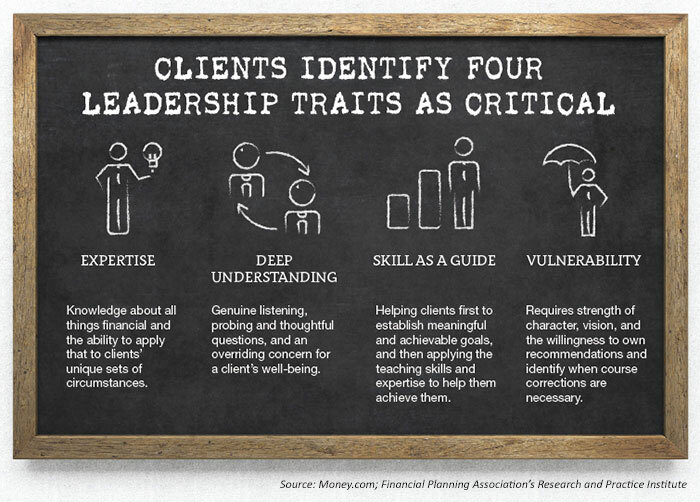 While every client is certainly interested in their personal planning and investment success, our ideal clients are most motivated by how long they will be remembered, by whom, and for what. Our reward comes from helping clients construct a life of meaning, purpose, and happiness. To me, this fits perfectly with the ultimate lesson of esse quam videri.